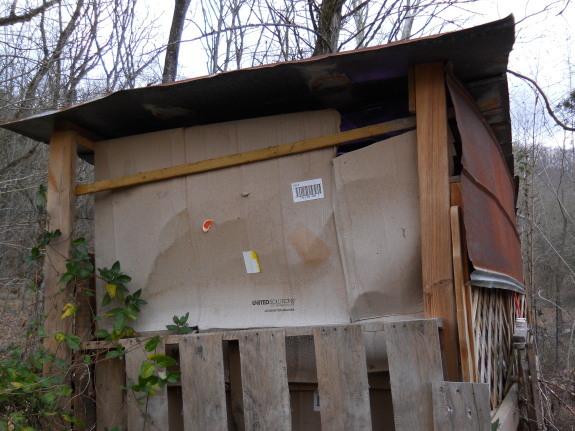 It's been almost a year since I used some scrap cardboard to block the wind in the used pallet chicken coop. There's no direct sun, and the roof keeps it dry. I'd say it's holding up pretty good. I can notice some slight fading, but it seems to have years left in it as an effective barrier. A person I worked with in the past made a camp hut from large sheets of cardboard including the roof. He painted the cardboard to protect it from the elements and was able to use the structure for years. I love pallets they work great for allot of things. I have used them to build gates, and decks and planter boxes. The best part is that they are usually free at business around town. Anonymous --- Fascinating! Now I want to try that. Maybe for the roof of my brother's chicken coop?